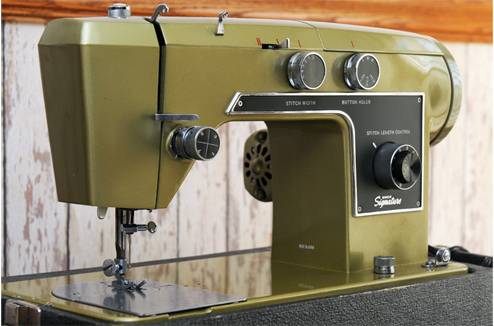 This is our Montgomery Ward Signature sewing machine. It is in very good condition as can be seen in the photographs. As of this writing (February 2011), it is being used to make a queen-size log cabin style quilt. So that we can distinguish this unit from our other machines, this machine is named Olive. We thought about the name Avocado but settled on Olive for obvious reasons. 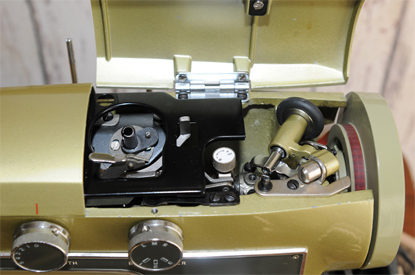 The image shows that the original motor is still intact as is the squeaky drive belt. This machine is Model UHT J277D and has a Serial Number of 27X 38670. Cams can be used to produce zigzag or other fancy stitches. 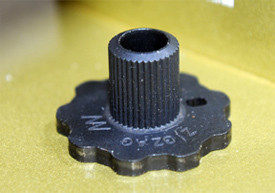 To wind a bobbin, the bobbin winder is flipped up out of its stowed position to where the rubber tire rides on the handwheel. Cosmetically speaking this is a nice touch as well as being effective. There are several controls contained in this area, including the small round white knob, that we have not experimented with. When we purchased the machine, it came with only one cam which is the zigzag cam shown. Using this cam, we were able to produce some of the finest satin stitches we have ever seen. Access to the vertical bobbin is obtained through a quite large opening. This is especially helpful for the fat-fingered member of the family. Olive uses a bobbin case and the bobbin is relatively large storing lots of thread. Notice the ample feed dogs. They allow the machine to pull lots of fabric along. We have never had a problem with it complaining about sewing over seams in multiple folds of fabric. 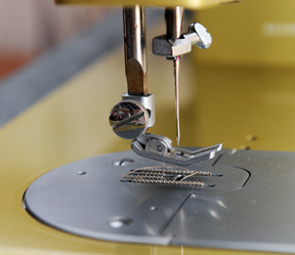 There are markings of the throat plate to aid in sewing seam allowances and range from 3/8-inch to 1-inch. Olive's original pressure foot is 5/8-inch wide. If one is a quilter and wishes to use the presser foot to sew a 1/4-inch seam allowance, it is hard to do with the 5/8-inch foot. Jim has learned that he can exchange the original foot with one from a low-shank non-slant-needle Singer machine with good results. 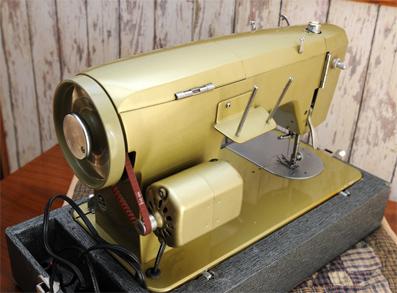 The foot currently in use was borrowed from our Singer Electronic 560 and works quite nicely. Depressing the center of the large knob reverses direction. 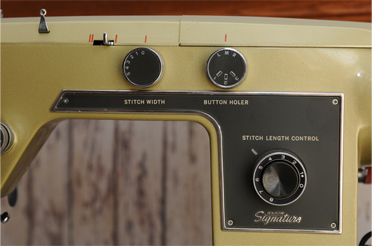 The top left knob adjusts stitch width when using cams. 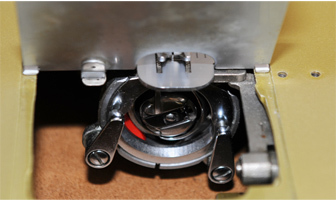 The knob also allows the operator to adjust the needle off center and move it from right to left. That is the sum total of our knowledge of this machine. There is a Sew-Darn control on the machine's bed. Olive's control is stuck so if we ever wish to lower the feed dogs, we will deal with her problem at that time. We have only one complaint with Olive at this time. That complaint is about her speed control. Her foot control has three speeds: fast, faster and really fast. We disassembled the foot control and believe it to be working as designed. There are times when sewing when we want the machine to creep along and this isn't going to happen with Olive. The problem is noteworthy when winding bobbins as the slowest speed is not comfortable for us and we find ourselves pulsing the foot control.